alaTest has collected and analyzed 193 reviews of Sony Bravia KD-49XE7073 Series. The average rating for this product is 4.6/5, compared to an average rating of 4.3/5 for other products in the same category for all reviews. We analyzed user and expert ratings, product age and more factors. 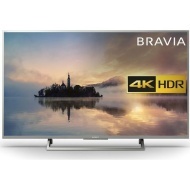 Compared to other products in the same category the Sony Bravia KD-49XE7073 Series is awarded an overall alaScore™ of 89/100 = Very good quality. "Everything about this product has met my expectations. I did some research before purchasing this Sony TV to replace an old 26" model. The picture quality is excellent, and the set did not take too much time to get used to the controls. " Owned this TV 3 weeks and so far delivers in everything except sound quality. It has 5 year warranty. So far, Incredible ... ! Had to buy a sound bar as the quality of sound from the tv is poor, but brilliant now. Having recently moved to another property, a tv was top of the shopping list, no other choice but a Sony. Have had Sonys for over 30 years, and they quality of the picture never fails to impress !